Askmelah could not have said it any better than Andrew Loh in pointing out that the ruling PAP instead of thinking of fixing the opposition, why not do some really really good work in fixing the real issues on hand that affect the citizens’ everyday lives than playing dirty politics and appearing self-righteous and overpaying its own kind. 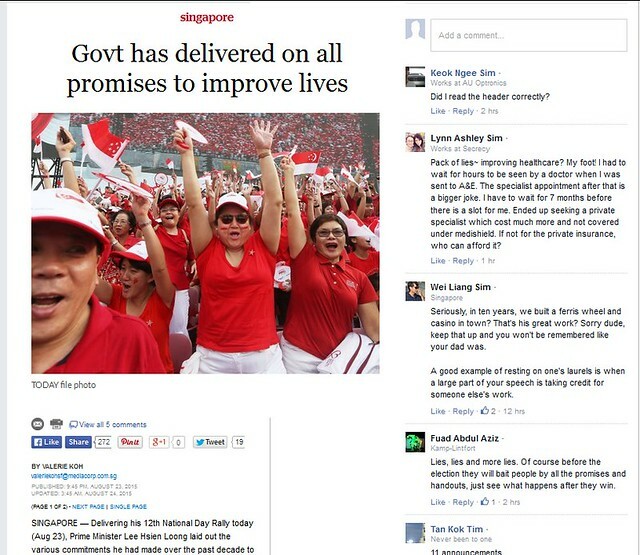 The citizens are no longer so gullible like in the early days so PAP please grow up. “July 25, 2015 – 3:08 am Return Our CPF $$$ & Go Harakiri! To get back our CPF $$$ @55! Our CPF R.O.I are peanuts & underpaid! Our living cost is above London, Paris, New York & Tokyo! SGporean become minority in Our own country! Our Leaders & MPs are Overated & Highest/Overpaid on this Planet! Our Citizens betrayed & become “new poor”! Our “red passport” given freely in return for new citizens votes! Overpaid paper Generals are appointed to critical Ministries & Agencies for possible coup? Million$$$ of our CPF & Taxpayers $$$ lost thru toxic & bad investment by GLCs, Temasek, Town Councils, Polytechnic etc. Current PAPaya has become “Vampires & Blood-Suckers” causing Pain, Suffering & Misery to Thousands of unemployed & poorly paid Singaporeans! Locals discriminated by employers preference for cheaper, younger & not-necessarily better Foreigners! Our industries flooded by cheaper labour with questionable degree, qualifications & experience! Picture above: LHL seems to be living in a diffferent world from most of his people! On a separate note, is it right that the public asks heads to roll when the MRT repeatedly breaking down? Remember the Saw Phaik Hwa incident? Askmelah says the question is the right one but the way the Government appoints people into leading these agencies is the wrong one. What makes the Government thinks that a past paper General will definitely be good CEO in running a company let alone one that requires deep knowledge and passion in running a mission critical organisation. With Tuesday’s massive breakdown of the MRT system, where both the North-South and East-West lines were paralysed for more than 3 hours, it is time for the Government and the SMRT to be held fully accountable for this pathetic state of affairs. Tuesday’s system failure comes after a year of “major delays” hitting “a record high” in 2014, and more than 5 years of commuters having to endure the unpredictable public train transport system. Tuesday’s shut-down of the train system is the single biggest such incident in the MRT’s history, affecting an estimated 250,000 commuters. And all these despite fares being raised virtually every year, in the name of “better service”. What is also galling is the massive amount of money being poured into the two public transport operators (PTOs), SMRT and SBS Transit, even as improvements in service standards remain negligible. This amounts to billions of dollars from taxpayers. It would thus seem that the more massive the failures, the more money is injected to correct them. And at the same time, those responsible for these failures are paid an increasing – and yes, massive – remuneration package. When Mr Kuek took on the job in 2012, he was paid S$500,000 for the first six months. Effectively, on an annualised basis, Mr Kuek saw his salary more than doubled in just three years on the job. This dwarfed that of his predecessor, Saw Phaik Hwa, who took home $1.85m before she was forced to step down in 2012. Yet, despite the record number of major breakdowns in 2014, and the more than five years of failing to fix the system, coupled with Tuesday’s incident, no one has been or will likely be brought to account. All Singaporeans and commuters are offered is another apology, another “I am extremely concerned” from minister Lui Tuck Yew. That is all the “accountability” Singaporeans will get from the Government, it seems. Mr Lee’s father, the late Lee Kuan Yew, apparently had no such problem. But by 2008, things were a bit different. The younger Lee, by then the prime minister of Singapore, said that “forcing ministers to resign was not Singapore’s way”, when rebutting the call for DPM Wong Kan Seng to resign. Mr Wong was the deputy prime minister and Minister of Home Affairs then, and it was during his tenure that Southeast-Asia’s number one terrorist suspect, Mas Selamat, escaped the grasp of Singapore’s authority not once but twice. “Singapore will not encourage a culture where ministers resign whenever things go wrong on their watch, whether or not they are actually to blame,” the Straits Times reported, citing what Mr Lee had said in Parliament during the debate on the escape of the alleged terrorist. However, Mr Lee did say that some will still be held accountable for the security lapses. But Mr Wong never was held to account and he was fielded as a PAP candidate in the next general election in 2011, and remains an MP for Bishan-Toa Payoh today. Yet, when it comes to others who are accused of failing, the Government and the PAP sings a whole different tune. For example, in the ongoing tussle between the Ministry of National Development (MND) and the opposition Workers’ Party (WP) town council, AHPETC, the Government has been engaged in a prolonged – two years so far – attack on AHPETC. And this after the AHPETC had subjected itself to and cooperated with, a Ministry of Finance-ordered audit by the Auditor General for an entire year where 12 to 18 auditors – including those from PricewaterHouse – camped out in the town council to go through the accounts. But they did not find anything criminal or funds missing. Yet, the PAP Government has not stopped but has taken to the courts to prolong the entire fishing expedition even further, wasting needless amounts of taxpayers’ money. Indeed, its minister, Khaw Boon Wan, made a haughty speech in Parliament, waxing lyrical about transparency and accountability, even if this included a bloody imagery of Japanese honour suicide. And so we come to Mr Lui and Mr Kuek. It has been at least 3 years since Mr Kuek took on the job, and many more since the problems with the train system first emerged. Singaporeans and commuters have had to endure one breakdown after another, with no end in sight. The Government has pumped in billions of taxpayers’ money – including rewarding the PTOs a million dollars just for providing basic dependable service. Fares are raised virtually every year. CEOs’ salaries are doubled, so much so that Mr Kuek now earns more than the country’s prime minister, even when they have not even found the actual problem with the train system. Calling them “glitches” is surely an understatement. Singaporeans can expect that nothing will happen – except perhaps more injection of massive amount of money into the PTOs again, and more fare hikes in the months ahead. Will Mr Lui and/or Mr Kuek do Mr Khaw proud and take to the sword themselves, voluntarily, so to speak? Or perhaps, as PM Lee once said, it is not in our culture to force such high-flying officials to resign? That (dis)honour belongs instead only to minions and others, it seems. But didn’t PM Lee himself say in 2008, “Those with supervisory oversight, or who are responsible for flawed systems, will also be held to account”? Will Mr Lee stick to his words, or was it just another plume of hot air coming out of his mouth? 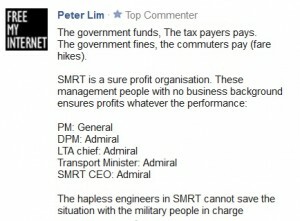 I have called SMRT Singapore Most Retarded Team for MRT are the Cheapest Form of Public Transport. The MRT is given free to SMRT and there lost monies. The only moving part are the wheels, but until now there cannot find the problems. I have wrote to them direct but there did not reply. Just call up and give some excuses for there do no want to have written answers. I can roughly know the main fault of the Trains System but who should I tell?